I must have watched too many episodes of MTV's "Cribs" because those big wheeled SUVs are really growing me. So much so that I decided to build this West Coast style Custom Cadillac Escalade EXT. I call it "The Radillac". 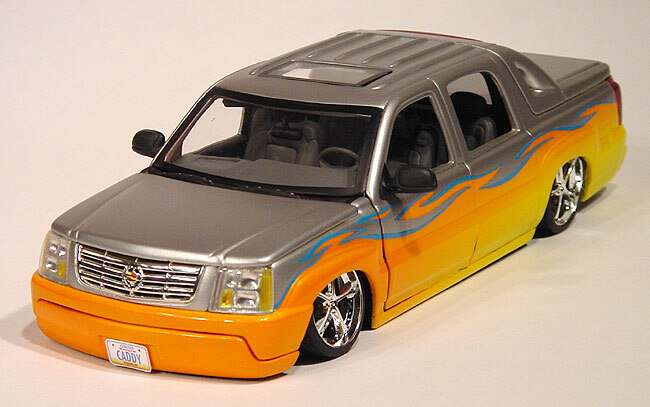 Originally this model was an Anson stock Escalade die-cast toy that I found at a KB toy store. It is not a rebuild of the Jada toys "DUBS" die-cast. Although the "DUBS" version is similar to this one, it is a larger scale. This Anson version is much closer to 1/25th scale. Since I bought it a year ago, Anson has gone out of business and this model is no longer available. Luckily, I bought two so I still have a stock one to display next to my custom. After disassembling the stock model, the paint was then stripped from the body by soaking over-night in lacquer thinner. I've found this to be the easiest way to strip die-cast models. The paint will just lift off the body in sheets and won't hurt the metal. Don't put any plastic parts in there of course or they will melt. Next, I made a few modifications to the body to give it more of a custom look. The front bumper was filled and smoothed. The roof rack was removed and all the holes filled. The side steps were cut off and new rocker panels were created from plastic sheet. The door handles were shaved and the rear bumper was notched for a center exit exhaust. Lastly, the custom tonneau cover was made from sheet plastic. The paint job has a real interesting story. 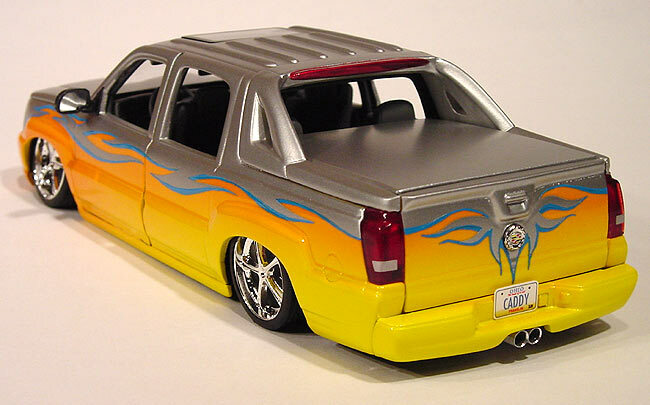 I originally had a different paint scheme in mind for this truck, but I went to the 2003 SEMA show in Las Vegas and was inspired by some of the cars I saw there. At the show, I saw about six different tuner-style cars with "flat metallic" paint jobs. It kind of reminded me of a high-tech version of the "primer rod" look. I really liked the look so I thought I would try and duplicate it on this truck. The paint consists of a white base coat followed by a pearl white over coat. On top of that I laid on a coat of Honda S2000 yellow pearl. To the yellow, I mixed a candy orange toner and airbrushed it in a fade on top of the yellow. Then PPG Concept 2000 clear urethane was airbushed over the lower half of the truck. Next, the flames were masked off and I airbrushed a custom-blended silver color mixed with a flattening agent on the upper half of the body. Finally, shadows were added to the flames by hand with blue One Shot Pinstripping Enamel. I wanted this truck to also have a real west-coast stance. So I gave it that super low, "down in the weeds" air-bag suspension look. Notice, the front wheels have the proper inward slant that these trucks get went the suspension is in full drop. The wheels and tires are aftermarket Hopping Hydro's 20"s which I bought at a swap meet. For the large diameter Brembo brakes, I borrowed a set from a Tamiya Focus WRC kit, made a rubber silicon mold and cast my own urethane replicas. Final details include custom license plates I made on my computer and aluminum tubing exhaust tips.